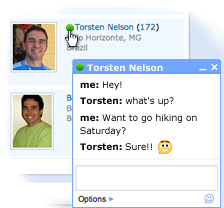 Google Talk is now gets fully integrated with Orkut. This was the most awaited feature. Today when I open my Orkut account I saw a message from orkut team. I was already aware of this feature but I was waiting for Orkut team to integrate this feature in my profile. Now you can chat with your friends without leaving your Orkut account. You can control which of your friends can chat with you from your settings tab. Please share your experience with us what you think about this new feature.